The Disabilities and Human Rights Group recently submitted a contribution to "Collaborative Solutions to Inequitable Urban Change – Photovoice Exercise", a research project organized by a University of Waterloo team. 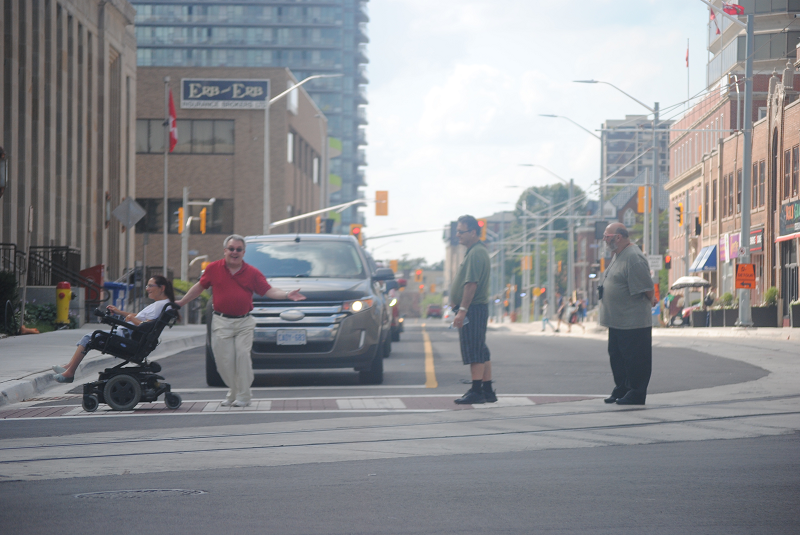 This study, which focuses on experiences of urban change in downtown Kitchener, aligns well with the current work being done by the Disabilities and Human Rights Group that is exploring impact of the new ION Light Rail Transit on pedestrian access along the route. The group has mapped pedestrian access points along the LRT route and will soon release an interactive map inviting the community to contribute feedback on pedestrian access. Please stay tuned for this opportunity to give feedback on your pedestrian experience. The attached narrative reflects the Disability and Human Rights Group members' initial experiences, concerns, and observations with the LRT.